In the Fall of 2017, Pack 52 implemented the Lion Program for boys entering Kindergarten. What Is the Lion Program? The Lion program weaves traditional Scouting concepts of character development, leadership skills, personal fitness and citizenship into activities that are age-appropriate and fun for the boys and their parents. The activities introduce the family to Cub Scouting, and provide an exciting way for the little guys to explore the world around them. The program will fuel their imagination, creativity and fun as they experience the growth Scouting can provide. At the end of the Lion year, they “graduate” to Tiger and advance through Cub Scouting. Lion is a family-oriented program. A youth and his parent or caring adult partner join Scouting together. A group of six to eight young scouts and their adult partners meet together in a group called a den. Dens will meet approximately twice per month. They have fun participating in den meetings and outings while making memories together. 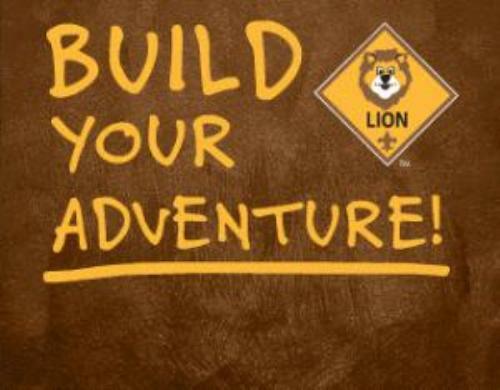 The Lion program encourages young scouts to learn and explore through hands-on, high-energy activities. Adult partners take turns leading a den meeting or outing during the year. Most meetings last approximately 45 minutes to an hour; outings are slightly longer. Young scouts are recognized for their accomplishments as they work toward the Lion badge. The Lion badge is earned by completing five adventures. Adventures are completed during the den meetings and outings. When an adventure is completed, the youth receives a sticker to put in his Lion Adventure Book. Den meetings and outings are facilitated by a Lion guide and participating parents. The Lion guide is an experienced Cub Scout leader. He or she will lead the first den meeting of the year. The Lion guide will help each adult partner lead one of the remaining meetings. The den meeting plans are provided in the Lion Parent and Leader Guidebook. The adult partner participates with the Lion in fun meetings and outings. He or she takes turns with other adult partners in leading a den meeting and/or outing. A Lion guide is a volunteer leader who provides direct support to your Lion den. The Cubmaster serves as the master of ceremonies for the monthly pack meeting. The pack meeting is an event where all of the dens in a Cub Scout pack come together for fun activities and awards. Lion dens usually attend two special pack meetings to accommodate the earlier bedtimes of Lions, but are able to attend all. The uniform for Lions is a Lion T-shirt with an optional cap. These items are available from the council’s Scout shop located at 1831 Speedway Ave Fairmont, WV. The Lion guide wears the same official adult uniform as other Cub Scout pack leaders. A Lion adult polo shirt or Cub Scouting activity T-shirt is also appropriate.